Click to return to my DRUMS OF AUTUMN webpage. Also posted on my web blog and my official Facebook Page on Friday, December 25, 2015. 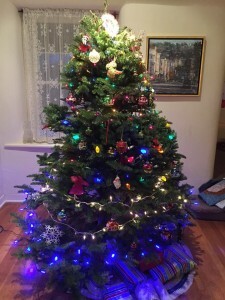 The image is of my family Christmas tree for 2015. This page was last updated on Saturday, December 26, 2015 at 9:34 a.m. (PT) by Diana’s Webmistress.